The 1920's come alive in the most charming way in Midnight in Paris!! One night, Gil gets drunk and wanders the streets of Paris. At midnight, an antique car pulls up, and the passengers—dressed in 1920s clothing—urge Gil to join them. They go to a bar, where Gil comes to realize that he has been transported to the 1920s, an era he idolizes. He encounters Cole Porter, Josephine Baker, and Zelda and F. Scott Fitzgerald, who take him to meet Ernest Hemingway. Hemingway agrees to show Gil's novel to Gertrude Stein, and Gil goes to fetch his manuscript from his hotel. However, as soon as he leaves the bar, he finds he has returned to 2010. Veteran actor-turned-director Woody Allen successfully took home the Best Screenplay award for his work in "Midnight in Paris". 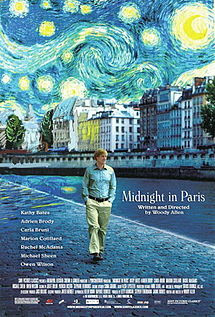 Midnight in Paris and The Artist get my vote for the most original and charming movies on the big screen. Mildred Pierce and Boardwalk Empire for vintage, TV dramas.